Choi made his debut as a television commercial model in 1987 and began his acting career three years later. He rose to stardom in 1993 with the popular TV show Our Paradise, and his resemblance to his elder sister, popular actress Choi Jin-sil gave him a head start in his career, while his young image helped him gain recognition in various TV dramas, commercials and even films. Choi’s acting career floundered but in 1999, after completing military service, he returned to the stage as a singer using the stage name SKY. His first album “Final Fantasy” was a success with the popular single Forever topping the music charts. He released his third and last album in 2004. In 2007, he returned to acting with a supporting role in the series “It’s OK, Because I Love You”, but failed to catch much attention. On March 29th, the sad news of yet another celebrity suicide spread across Korea like wildfire as Choi Jin-young passed away at the age of 39. On the 31st, Choi Jin-young’s mother arrived at a crematory in Seongnam for her son’s cremation. However, during the emotionally difficult process, she fainted. If you don’t remember, her daughter, Choi Jin-shil also committed suicide two years ago so you can only imagine how emotionally distraught the mother must be. On March 29, 2010, Choi hanged himself with an electrical cord in the attic of his apartment in Nonhyeon-dong, Seoul. His body was found by his mother and a woman identified as Chung, who was his junior in college. When Choi did not answer the phone, Chung alerted Choi’s mother and the two hurried to his home together. They called the police and a 119 rescue squad around 2:14 p.m. Choi was rushed to Gangnam Severance Hospital for CPR at 2:46 p.m. but was pronounced dead on arrival. Choi’s body was cremated and buried next to his sister at the Kapsan Cemetery in Yangpyeong, Gyeonggi Province. 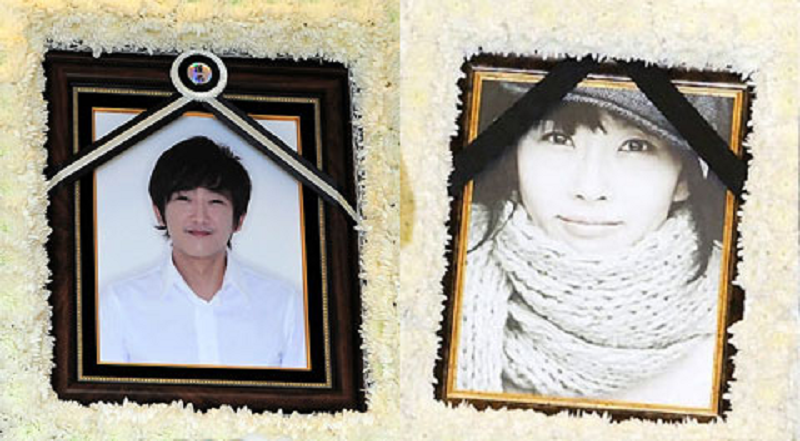 When Choi Jin-sil committed suicide on October 2, 2008, photos of Choi in tears clutching his sister’s picture shook the nation, and fans wept with him as he led her funeral procession. Acting upon his late sister’s wishes to finish college, he belatedly enrolled in Hanyang University to study acting in 2009, and played Demetrius in a staging of Shakespeare’s A Midsummer Night’s Dream. Suffering from depression after his sister’s death, Choi canceled engagements for more than a year. Friends later said he made several suicide attempts and had his stomach pumped for a drug overdose in 2009. Refusing his mother’s pleas that he sees a doctor, Choi relied instead on non-prescription tranquilizers he bought from a pharmacy. In January 2010 Choi signed with a new agency, MCloud Entertainment and announced plans on March 2nd, 2010 to resume activities in the first half of the year, but his approaching comeback added to his stress and he increasingly felt frustrated that he wasn’t getting cast in any TV series. Take a Look at BTS’s V (Kim Tae-hyung) Inspired Outfit and Airport Fashion Style! Get to Know Shin Hyun-joon and His Wife More! Are You Curious About Who EXO’s Kai Girlfriend Is? Day6 Finally Revealed Their Official Fandom Name!